The doorway out of ESA's Hertz test chamber, used to test the radio performance of large space antennas, as captured by photographer Edgar Martin. Part of ESA's technical heart in the Netherlands, the metal-walled 'Hybrid European Radio Frequency and Antenna Test Zone' chamber is shut off from all external influences. 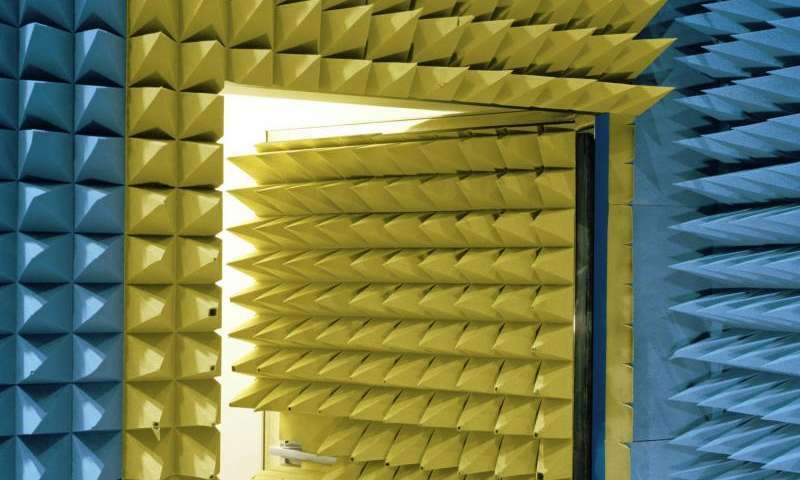 Its internal walls are studded with radio-absorbing 'anechoic' foam pyramids, allowing radio-frequency testing without any distorting reflections. In addition, this cladding also absorbs sound – making Hertz an eerily quiet place to work. Portuguese-born Edgar Martins has collaborated closely with ESA to produce a comprehensive photographic survey of the Agency's various facilities around the globe, together with those of its international partners. The striking results were collected in a book and exhibition, entitled The Rehearsal of Space and The Poetic Impossibility to Manage the Infinite. Characteristically empty of people, Martins' long-exposure photos – taken with analogue wide film cameras – possess a stark, reverent style. They document the variety of specialised installations and equipment needed to prepare missions for space, or to recreate orbital conditions for testing down on Earth.